Opens up the radical and challenging implications of 1 Peter for contemporary Christian leadership. 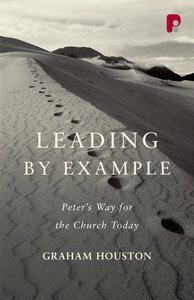 ^Leading by Example is the only book which explores^the practical theology of 1 Peter with particular^reference to Christian leadership. ^^^Graham Houston critiques the trend in recent books to relate contemporary management theories to church^leadership. He explores 1 Peter's expose of the^problem of authoritarianism ('lording It') in the early^church, and its development of an alternative model of^servant leadership. ^^^Houston blends insights from current New Testament^scholarship, sociology, theology, psychology and from^years of Christian ministry to allow the ancient biblical^text to address our current situations afresh. ^^^He challenges us to look away from apparent western^success stories for examples to follow, and rather to^look to the apparent fringes of God's work in today's^two-thirds world. Leading by Example is essential reading for any who^want to see how the biblical text can help Christian^leaders serve the purposes of God in a more Christ-like^and radical way. Rev Dr.Graham R Houston is minister of two parishes in South Lanarkshire, Scotland and moderator of Lanark Presbytery. He is the author of Virtual morality: Christian ethics in a computer age and Leading by Example:Peters Way for the Church Today.